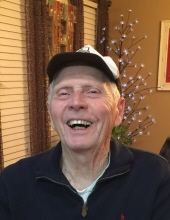 Milton V. Carter, 84, passed away Thursday, January 31, 2019, at Eastmont Towers in Lincoln, Nebraska. Milton was born January 11, 1935 in Dallas, South Dakota, the son of Guy F. and Frances I. (Vavra) Carter. He graduated from Dallas High School in Dallas, South Dakota with the class of 1956. Milton graduated from Yankton College and served in the U. S. Army. He married Sandra Heuston on December 3, 1966 in Omaha, Nebraska. Milton was in education for over 40 years, teaching in Iowa and various schools in Nebraska. After receiving his masters from UNK, he went on to be Superintendent in Arcadia and Loup County in Nebraska. He was a member of the American Legion. Milton enjoyed woodworking, refinishing antiques, remolding homes, drawing, painting, and singing. Milton is survived by his wife Sandra Carter of Lincoln, NE; children, Joe (Beth) Carter, Debi (Duane) Haack all of Lincoln, NE, Wendy (John) Prochaska of Dickinson, ND, and Rick Carter of Lincoln, NE; fourteen grandchildren, Eric (Meggan), Ben (Melissa), Mitch (Jenna), Nicole (Steve), Derek (Lynn), Daryl (Dorothy), Mackenzie (Senan), Mikayla (Tony), Meghan (Jon), Brooke, Marisa, Charlie, Eloise, and Ryder; thirteen great-grandchildren; sister, Darlene (Robert) Wilken; two brothers, Don Carter and Delwin (Penny) Carter; along with numerous nieces and nephews. He was preceded in death by his parents; great-granddaughter, McKenna; siblings, Albert, Eldon, Art, Irene, Claire, Vic, and Gloria. Visitation will be from 4:00 pm to 6:00 pm, Sunday, February 3, 2019 at Colonial Chapel Funeral Home, 5200 R St. Colonial Chapel Funeral Home is handling arrangements. Memorials may be given to the family for a future scholarship or donations to the Food Bank of Lincoln for the Backpack Program. To send flowers or a remembrance gift to the family of Milton V. Carter, please visit our Tribute Store. "Email Address" would like to share the life celebration of Milton V. Carter. Click on the "link" to go to share a favorite memory or leave a condolence message for the family.